This article is about the art museum. For the art school associated with the museum, see School of the Art Institute of Chicago. The Art Institute of Chicago, founded in 1879 and located in Chicago's Grant Park, is one of the oldest and largest art museums in the United States. Recognized for its curatorial efforts and popularity among visitors, the museum hosts approximately 1.5 million guests annually. Its collection, stewarded by 11 curatorial departments, is encyclopedic, and includes iconic works such as Georges Seurat's A Sunday on La Grande Jatte, Pablo Picasso's The Old Guitarist, Edward Hopper's Nighthawks, and Grant Wood's American Gothic. Its permanent collection of nearly 300,000 works of art is augmented by more than 30 special exhibitions mounted yearly that illuminate aspects of the collection and present cutting-edge curatorial and scientific research. As a research institution, the Art Institute also has a conservation and conservation science department, five conservation laboratories, and one of the largest art history and architecture libraries in the country—the Ryerson and Burnham Libraries. The growth of the collection has warranted several additions to the museum's original 1893 building, which was constructed for the World's Columbian Exposition of the same year. The most recent expansion, the Modern Wing designed by Renzo Piano, opened in 2009 and increased the museum's footprint to nearly one million square feet, making it the second-largest art museum in the United States, after the Metropolitan Museum of Art. The Art Institute is associated with the School of the Art Institute of Chicago, a leading art school, making it one of the few remaining unified arts institutions in the United States. In 1866, a group of 35 artists founded the Chicago Academy of Design in a studio on Dearborn Street, with the intent to run a free school with its own art gallery. The organization was modeled after European art academies, such as the Royal Academy, with Academicians and Associate Academicians. The Academy's charter was granted in March 1867. Classes started in 1868, meeting every day at a cost of $10 per month. The Academy's success enabled it to build a new home for the school, a five-story stone building on 66 West Adams Street, which opened on November 22, 1870. When the Great Chicago Fire destroyed the building in 1871 the Academy was thrown into debt. Attempts to continue despite the loss by using rented facilities failed. By 1878, the Academy was $10,000 in debt. Members tried to rescue the ailing institution by making deals with local businessmen, before some finally abandoned it in 1879 to found a new organization, named the Chicago Academy of Fine Arts. When the Chicago Academy of Design went bankrupt the same year, the new Chicago Academy of Fine Arts bought its assets at auction. With the announcement of the World's Columbian Exposition to be held in 1892–93, the Art Institute pressed for a building on the lakefront to be constructed for the fair, but to be used by the Institute afterwards. The city agreed, and the building was completed in time for the second year of the fair. Construction costs were met by selling the Michigan/Van Buren property. On October 31, 1893, the Institute moved into the new building. For the opening reception on December 8, 1893, Theodore Thomas and the Chicago Symphony Orchestra performed. From the 1900s (decade) to the 1960s the school offered with the Logan Family (members of the board) the Logan Medal of the Arts, an award which became one of the most distinguished awards presented to artists in the US. Between 1959 and 1970, the Institute was a key site in the battle to gain art and documentary photography a place in galleries, under curator Hugh Edwards and his assistants. As Director of the museum starting in the early 1980s, James N. Wood conducted a major expansion of its collection and oversaw a major renovation and expansion project for its facilities. As "one of the most respected museum leaders in the country", as described by The New York Times, Wood created major exhibitions of works by Paul Gauguin, Claude Monet and Vincent van Gogh that set records for attendance at the museum. He retired from the museum in 2004. In 2006, the Art Institute began construction of "The Modern Wing", an addition situated on the southwest corner of Columbus and Monroe. The project, designed by Pritzker Prize winning architect Renzo Piano, was completed and officially opened to the public on May 16, 2009. The 264,000-square-foot (24,500 m2) building makes the Art Institute the second-largest art museum in the United States. The building houses the museum's world-renowned collections of 20th and 21st century art, specifically modern European painting and sculpture, contemporary art, architecture and design, and photography. In 2014, travel review website and forum, Tripadvisor, reviewed millions of travelers' surveys and named the Art Institute the world's best museum. It has remained a top three museum through 2016. In April 2015, it was announced that the museum received perhaps the largest gift of art in its history. Collectors Stefan Edlis and Gael Neeson donated a "collection [that] is among the world's greatest groups of postwar Pop art ever assembled." The donation includes works by Andy Warhol, Jasper Johns, Cy Twombly, Jeff Koons, Charles Ray, Richard Prince, Cindy Sherman, Roy Lichtenstein and Gerhard Richter. The museum agreed to keep the donated work on display for at least 50 years. In June 2018, the museum received a $50 million donation, the largest single announced monetary donation in its history. The collection of the Art Institute of Chicago encompasses more than 5,000 years of human expression from cultures around the world and contains more than 300,000 works of art in 11 curatorial departments. The museum holds works of art ranging from early Japanese prints to the art of the Byzantine Empire to contemporary American art. It is principally known for one of the United States' finest collection of paintings produced in Western culture. The Art Institute's African Art and Indian Art of the Americas collections are on display across two galleries in the south end of the Michigan Avenue building. The African collection includes more than 400 works that span the continent, highlighting ceramics, garments, masks, and jewelry. The Amerindian collection includes Native North American art and Mesoamerican and Andean works. From pottery to textiles, the collection brings together a wide array of objects that seek to illustrate the thematic and aesthetic focuses of art spanning the Americas. The Art Institute's American Art collection contains some of the best-known works in the American canon, including Edward Hopper's Nighthawks, Grant Wood's American Gothic, and Mary Cassatt's The Child's Bath. The collection ranges from colonial silver to modern and contemporary paintings. 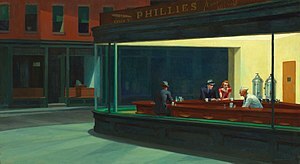 Nighthawks was originally purchased by the museum in 1942 for $3,000; its acquisition "launched" the painting into "immense popular recognition." Considered an "icon of American culture", Nighthawks is perhaps Hopper's most famous painting, as well as one of the most recognizable images in American art. American Gothic has been in the museum's collection since 1930 and was only just recently loaned outside of North America for the first time in 2016. Wood's painting depicts what has been called "the most famous couple in the world," a dour, rural-American, father and daughter. It was entered into a contest at the Art Institute in 1930, and although not a favorite of some, it won a medal and was acquired by the museum. The Art Institute's ancient collection spans nearly 4,000 years of art and history, showcasing Greek, Etruscan, Roman, and Egyptian sculpture, mosaics, pottery, jewelry, glass, and bronze as well as a robust and well-maintained collection of ancient coins. There are around 5,000 works in the collection, offering a comprehensive survey of the ancient and medieval Mediterranean world, beginning with the third millennium B.C. and extending to the Byzantine Empire. The collection also holds the mummy and mummy case of Paankhenamun. The Department of Architecture and Design holds more than 140,000 works, from models to drawings from the 1870s to the present day. The collection covers landscape architecture, structural engineering, and industrial design, including the works of Frank Lloyd Wright, Ludwig Mies van der Rohe, and Le Corbusier. The Art Institute's Asian collection spans nearly 5,000 years, including significant works and objects from China, Korea, Japan, India, southeast Asia, and the Near and Middle East. There are 35,000 objects in the collection, showcasing bronzes, ceramics, and jades as well as textiles, screens, woodcuts, and sculptures. One gallery in particular attempts to mimic the quiet and meditative way in which Japanese screens are traditionally viewed. The Art Institute's collection of European decorative arts includes some 25,000 objects of furniture, ceramics, metalwork, glass, enamel, and ivory from 1100 A.D. to the present day. The department contains the 1,544 objects in the Arthur Rubloff Paperweight Collection and the 68 Thorne Miniature Rooms–a collection of miniaturized interiors of a 1:12 scale showcasing American, European, and Asian architectural and furniture styles from the Middle Ages to the 1930s (when the rooms were constructed). Both the paperweights and the Thorne Rooms are located on the ground floor of the museum. Georges Seurat, A Sunday Afternoon on the Island of La Grande Jatte, 1884-86. The museum is most famous for its collections of Impressionist, Post-Impressionist paintings, widely regarded[by whom?] as one of the finest collections outside of France. Highlights include more than 30 paintings by Claude Monet, including six of his Haystacks and a number of Water Lilies. Also in the collection are important works by Pierre-Auguste Renoir such as Two Sisters (On the Terrace), and Gustave Caillebotte's Paris Street; Rainy Day. Post-Impressionist works include Paul Cézanne's The Basket of Apples, and Madame Cézanne in a Yellow Chair. At the Moulin Rouge by Henri de Toulouse-Lautrec is another highlight. The pointillist masterpiece, which also inspired a musical and was famously featured in Ferris Bueller's Day Off, Georges Seurat's Sunday Afternoon on La Grande Jatte—1884, is prominently displayed. Additionally, Henri Matisse's Bathers by a River, is an important example of his work. Highlights of non-French paintings of the Impressionist and Post-Impressionist collection include Vincent van Gogh's Bedroom in Arles and Self-portrait, 1887. In the mid-1930s, the Art Institute received a gift of over one hundred works of art from Annie Swan Coburn ("Mr. and Mrs. Lewis Larned Coburn Memorial Collection"). The "Coburn Renoirs" became the core of the Art Institute's Impressionist painting collection. The collection also includes the Medieval and Renaissance Art, Arms, and Armor holdings and three centuries of Old Masters works. The museum's collection of modern and contemporary art was significantly augmented when collectors Stefan Edlie and Gael Neeson gifted 40 master works to the department in 2015. Pablo Picasso's Old Guitarist, Henri Matisse's Bathers by a River, Constantin Brâncuși's Golden Bird, and René Magritte's Time Transfixed are highlights of the modern galleries, located on the third floor of the Modern Wing. The contemporary installation, located on the second floor, contains works by Andy Warhol, Cindy Sherman, Cy Twombly, Jackson Pollock, Jasper Johns, and other significant modern and contemporary artists. The Art Institute didn't officially establish a photography collection until 1949, when Georgia O'Keeffe donated a significant portion of the Alfred Stieglitz collection to the museum. Since then, the museum's collection has grown to approximately 20,000 works spanning the history of the artform from its inception in 1839 to the present. The print and drawings collection began with a donation by Elizabeth S. Stickney of 460 works in 1887, and was organized into its own department of the museum in 1911. Their holdings have subsequently grown to 11,500 drawings and 60,000 prints, ranging from 15th-century works to contemporary. The collection contains a strong group of the works of Albrecht Dürer, Rembrandt van Rijn, Francisco Goya, and James McNeill Whistler. Because works on paper are sensitive to light and degrade quickly, the works are on display infrequently in order to keep them in good condition for as long as possible. The Department of Textiles has more than 13,000 textiles and 66,000 sample swatches in total, covering an array of cultures from 300 B.C. to the present. From English needlework to Japanese garments to American quilts, the collection presents a diverse group of objects, including contemporary works and fiber art. The current building at 111 South Michigan Avenue is the third address for the Art Institute. It was designed in the Beaux-Arts style by Shepley, Rutan and Coolidge of Boston for the 1893 World's Columbian Exposition as the World's Congress Auxiliary Building with the intent that the Art Institute occupy the space after the fair closed. The Art Institute's famous western entrance on Michigan Avenue is guarded by two bronze lion statues created by Edward Kemeys. The lions were unveiled on May 10, 1894, each weighing more than two tons. The sculptor gave them unofficial names: the south lion is "stands in an attitude of defiance," and the north lion is "on the prowl." When a Chicago sports team plays in the championships of their respective league (i.e. the Super Bowl or Stanley Cup Finals, not the entire playoffs), the lions are frequently dressed in that team's uniform. Evergreen wreaths are placed around their necks during the Christmas season. The east entrance of the museum is marked by the stone arch entrance to the old Chicago Stock Exchange. Designed by Louis Sullivan in 1894, the Exchange was torn down in 1972, but salvaged portions of the original trading room were brought to the Art Institute and reconstructed. The Art Institute building has the unusual property of straddling open-air railroad tracks. Two stories of gallery space connect the east and west buildings while the Metra Electric and South Shore lines operate below. The lower level of gallery space was formerly the windowless Gunsaulus hall, but is now home to the Alsdorf Galleries showcasing Indian, Southeast Asian and Himalayan Art. During renovation, windows facing north toward Millennium Park were added. The gallery space was designed by Renzo Piano in conjunction with his design of the Modern Wing and features the same window screening used there to protect the art from direct sunlight. The upper level formerly held the modern European galleries, but was renovated in 2008 and now features the Impressionist and Post-Impressionist galleries. Located on the ground floor of the museum is the Ryerson & Burnham Libraries. The Libraries' collections cover all periods of art, but is most known for its extensive collection of 18th to 20th century architecture. It serves the museum staff, college and university students, and is also open to the general public. The Friends of the Libraries, a support group for the Libraries, offers events and special tours for its members. On May 16, 2009, the Art Institute opened the Modern Wing, the largest expansion in the museum's history. The 264,000-square-foot (24,500 m2) addition, designed by Renzo Piano, makes the Art Institute the second-largest museum in the US. The architect of record in the City of Chicago for this building was Interactive Design. The Modern Wing is home to the museum's collection of early 20th-century European art, including Pablo Picasso's The Old Guitarist, Henri Matisse's Bathers by a River, and René Magritte's Time Transfixed. The Lindy and Edwin Bergman Collection of Surrealist art includes the largest public display of Joseph Cornell's works (37 boxes and collages). The Wing also houses contemporary art from after 1960; new photography, video media, architecture and design galleries including original renderings by Frank Lloyd Wright, Ludwig Mies van der Rohe and Bruce Goff; temporary exhibition space; shops and classrooms; a cafe and a restaurant, Terzo Piano, that overlooks Millennium Park from its terrace. In addition, the Nichols Bridgeway connects a sculpture garden on the roof of the new wing with the adjacent Millennium Park to the north and a courtyard designed by Gustafson Guthrie Nichol. In 2009, the Modern Wing won at the Chicago Innovation Awards. Note that other notable works are in the collection but the following examples are ones in the public domain and for which pictures are available. In 2018, as it redesigned its website, the Art Institute released 52,438 of its public domain works, under the Creative Commons Zero (CC0) licence. Ancient Greek Amphora depicts Herakles killing the Nemean Lion, with Iolaus and Nemea on the left and Athena and Hermes on the right. 550–525 BC. During 2009, attendance was around 2 million—up 33 percent from 2008—in addition to a total of approximately 100,000 museum memberships. Despite a 25 percent boost in museum admission fees, the Modern Wing was a major catalyst for a rise in visitor traffic. As of 2011, the Art Institute continues to rebuild its $783 million endowment since the recession. In June 2008, its endowment was $827 million. As of 2012, the museum is rated A1 by Moody's, its fifth-highest grade, in part reflecting the museum's pension and retirement liabilities; Standard & Poor's rates the museum A+, fifth-best. In October 2012, the Art Institute sold about $100 million of taxable and tax-exempt bonds partly to shore up unfunded pension obligations. The $294 million extension in 2009 was the culmination of a $385 million fundraising campaign—roughly $300 million for design and construction and $85 million for the endowment. Around $370 million were raised primarily from private patrons in Chicago. In 2011, the Art Institute received a $10 million gift from the Jaharis Family Foundation to renovate and expand galleries devoted to Greek, Roman and Byzantine art, as well as to support acquisitions and special exhibitions of that art. In 1990, the Art Institute of Chicago sold 11 works at auction, including paintings by Claude Monet, Pablo Picasso, Amedeo Modigliani, Maurice Utrillo and Edgar Degas, to raise the $12 million purchase price of a bronze sculpture, Golden Bird, by Constantin Brâncuși. At the time, the sculpture was owned by the Arts Club of Chicago, which was selling it to buy a new gallery for its other works. In 2005, the museum sold two paintings by Marc Chagall and Auguste Renoir at Sotheby's. In 2011, it auctioned two Picassos (Sur l'impériale traversant la Seine (1901) and Verre et pipe (1919)), Henri Matisse's Femme au fauteuil (1919), and Georges Braque's Nature morte à la guitare (rideaux rouge) (1938) at Christie's in London. In 2002, the Art Institute of Chicago filed suit alleging fraud by a small Dallas firm called Integral Investment Management, along with related parties. The museum, which put $43 million of its endowment into funds run by the defendants, claimed that it faced losses of up to 90% on the investments after they soured. In 2010, the year after the opening of its massive Modern Wing, the Art Institute of Chicago sued the engineering firm Ove Arup for $10 million over what it said were flaws in the concrete floors and air-circulation systems. The suit was settled out of court. Film director John Hughes included a sequence in the Art Institute in the 1986 film Ferris Bueller's Day Off, which is set in Chicago. Hughes had first visited the Institute as a "refuge" while in high school. Hughes' commentary on the sequence was used as a reference point by journalist Hadley Freeman in a discussion of the Republican Presidential primary candidates in 2011. The paintings used in the 1970 Parker Brothers board game Masterpiece are works held in the Art Institute's collection. ^ Johnson, Steve. "Chicago museums set attendance records in 2016". chicagotribune.com. Retrieved 22 December 2017. ^ a b Roberta Smith (13 May 2009). "A Grand and Intimate Modern Art Trove". The New York Times. NYTimes.com. Retrieved 2011-06-13. ^ a b c d Hilliard, Celia (2010). "The Prime Mover" - Charles L. Hutchinson and the making of the Art Institute of Chicago. Chicago: The Art Institute of Chicago. ISBN 978-086559-238-4. ^ "Few Changes Made - University of Chicago Trustees Hold an Election - Two Vacancies Filled - Other Members Whose Terms Expired Re-Elected - Examinations for Positions as Teachers in the Public Schools of the City". The Daily Inter-Ocean: 1. June 28, 1893. ^ Dillon, Diane (2004-09-18). "The Encyclopedia of Chicago - Art Institute of Chicago". The Newberry Library. Retrieved July 24, 2015. ^ "The Art Institute – The Western Art Movement and its Splendid Achievements in Chicago – The New Home of the Fine Arts – The Ward Collection – The Century, Harper's - The Formal Opening of the New Museum – The Loan Collection – A Noble Triumph". The (Chicago) Inter Ocean. XVI (239): 9. November 20, 1887. ^ Kennedy, Randy. "James N. Wood, President of the Getty Trust, Dies at 69", The New York Times, June 14, 2010. Accessed June 21, 2010. ^ Kamin, Blair. "ART INSTITUTE TO ADD NEW WING". chicagotribune.com. Retrieved 2018-06-22. ^ Grossman, Samantha (2014-09-18). "These Are the 25 Best Museums in the World". Time. Retrieved September 19, 2014. ^ Tripadvisor (2014-09-18). 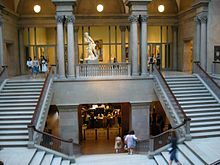 "Top 25 Museums—United States". Retrieved September 28, 2016. ^ Chicago Tribune (22 April 2015). "Art Institute of Chicago gets its largest gift ever, including 9 Warhols". chicagotribune.com. ^ a b "Gift Worth $400 Million To Art Institute Of Chicago Includes Works By Warhol". NPR.org. 22 April 2015. ^ Johnson, Steve. "Art Institute lands largest announced cash donation, $70 million in total". chicagotribune.com. Retrieved 2018-06-22. ^ Chilvers, Ian, ed. (2004). The Oxford Dictionary of Art: The Art Institute of Chicago. Oxford University Press. pp. 813–814. ISBN 978-0192800220. Celebrated masterpieces: Nighthawks; American Gothic; A Sunday Afternoon on the Island of La Grande Jatte. ^ "World's most beautiful museums". Fox News.com. 2013-05-03. Retrieved 2013-05-04. Must-see masterpieces: Georges Seurat's A Sunday on the Island of La Grande Jatte, Nighthawks, and Vincent Van Gogh's Bedroom in Arles. ^ "African | The Art Institute of Chicago". www.artic.edu. Retrieved 2016-08-03. ^ "Indian Art of the Americas | The Art Institute of Chicago". www.artic.edu. Retrieved 2016-08-03. ^ a b "Nighthawks". artic.edu. ^ The sale was recorded by Josephine Hopper as follows, in volume II, p. 95 of her and Edward's journal of his art: "May 13, '42: Chicago Art Institute - 3,000 + return of Compartment C in exchange as part payment. 1,000 - 1/3 = 2,000." See Deborah Lyons, Edward Hopper: A Journal of His Work New York: Whitney Museum of American Art, 1997, p. 63. ^ "Art Institute of Chicago". visual-arts-cork.com. ^ Levin, Gail (1996). "Edward Hopper's Nighthawks, Surrealism, and the War". Art Institute of Chicago Museum Studies. 22 (2): 180–195 at 189, 193–194. doi:10.2307/4104321. ^ "Edward Hopper". A Closer Look. National Gallery of Art. 2006. Retrieved 2013-04-30. ^ "About This Artwork: Nighthawks, 1942". Art Institute of Chicago. Retrieved 2013-05-04. ^ "Edward Hopper's Nighthawks". Present at the Creation. National Public Radio. 2002-10-07. Retrieved 2013-05-04. ^ Wood, James N. (1996). The Art Institute of Chicago, 20th-Century: Painting and Sculpture. Chicago: The Art Institute of Chicago. ISBN 0865590966. ^ "American Gothic | The Art Institute of Chicago". www.artic.edu. Retrieved 2016-08-03. ^ "About This Artwork: American Gothic". The Art Institute of Chicago. Archived from the original on 28 May 2010. Retrieved June 20, 2010. ^ "Ancient and Byzantine | The Art Institute of Chicago". www.artic.edu. Retrieved 2016-08-03. ^ "Coffin and Mummy Case of Paankhenamun" (PDF). Retrieved 2013-01-13. ^ "Coffin and Mummy of Paankhenamun | The Art Institute of Chicago". www.artic.edu. Retrieved 2016-08-03. ^ "Architecture and Design | The Art Institute of Chicago". www.artic.edu. Retrieved 2016-08-03. ^ "Asian | The Art Institute of Chicago". www.artic.edu. Retrieved 2016-08-03. ^ "Thorne Miniature Rooms". artic.edu. Archived from the original on 15 June 2011. Retrieved 2011-06-13. ^ "Case 8: Annie Swan Coburn". Women of the Art Institute. The Art Institute of Chicago. Retrieved 16 June 2018. ^ "Arms, Armor, Medieval, and Renaissance | The Art Institute of Chicago". www.artic.edu. Retrieved 2016-08-03. ^ Tribune, Chicago. "Massive art gift transforms Art Institute". Retrieved 2016-08-03. ^ "Modern | The Art Institute of Chicago". www.artic.edu. Retrieved 2016-08-03. ^ "Photography | The Art Institute of Chicago". www.artic.edu. Retrieved 2016-08-03. ^ Engelbrecht, Theresa Moir. "Inter-Collected: The Shared History of the Print Club and Museum Collection," Art in Print Vol. 7 No. 2 (July–August 2017), 30. ^ "Textiles | The Art Institute of Chicago". www.artic.edu. Retrieved 2016-08-03. ^ "1879–1913: The Formative Years". The Art Institute of Chicago. 2007. Archived from the original on 9 June 2007. Retrieved 2007-06-20. ^ Nicolai Ourossof (13 May 2009). "Renzo Piano Embraces Chicago". The New York Times. NYTimes.com. Archived from the original on 13 May 2011. Retrieved 2011-06-13. ^ "Joseph Cornell's Works At The Art Institute". Chicago Tribune. March 23, 1997. ^ "2009 Chicago Innovation Award winners". Chicago Innovation Awards. Archived from the original on 2010-03-11. ^ "Behind the Scenes of the Website Redesign - The Art Institute of Chicago". The Art Institute of Chicago. Retrieved 2018-11-29. ^ Lauren Viera (May 9, 2011), Art Institute leader resigns Chicago Tribune. ^ Kelly Crow (August 24, 2011), "Chicago's Art Institute Names New Director". The Wall Street Journal. ^ Brian Chappatta (October 9, 2012), Chicago Art Institute Borrows $100 Million for Pensions Businessweek. ^ Jason Edward Kaufman (May 13, 2009), Art Institute of Chicago’s massive extension opens Archived October 16, 2012, at the Wayback Machine The Art Newspaper. ^ Kate Taylor (February 27, 2011), A Gift for Art Institute The New York Times. ^ Chicago Gallery to Sell 11 Works to Buy Brancusi Los Angeles Times, May 10, 1990. ^ Carol Vogel (October 26, 2005), Museums Set to Sell Art, and Some Experts Cringe The New York Times. ^ Lauren Viera (January 11, 2011), Art Institute paintings to fetch $10-$16 million at auction Chicago Tribune. ^ Pogrebin, Robin (January 26, 2011). "The Permanent Collection May Not Be So Permanent". The New York Times. ^ "Stick to paintings". The Economist. 3 January 2002. Retrieved 2014-10-24. ^ Finkel, Jori (3 June 2014). "Eli Broad's Art Showcase, Still Unfinished, Sues Over Delays in Los Angeles". The New York Times. ^ Kapos, Shia (17 September 2013). "Art Institute closes Modern Wing's 3rd floor for 7 months". Crain's Chicago Business. Retrieved 2014-10-24. ^ John Hughes commentary - The Museum scene from Ferris Bueller's Day Off. YouTube. 7 August 2009. Wikimedia Commons has media related to Art Institute of Chicago.